According to my training plan, I was supposed to sign up for a 5k on the June 7th weekend, but I couldn’t find any I was remotely interested in paying the money for. I did happen upon this five miler, however, in its inaugural year. I decided to sign up for it, planning on treating it kind of like a 5k pace interval run to gear up for my two 5ks in the next couple months. And then my knee happened. I took it easy for the few weeks before the race, but that meant I wasn’t in quite as good of shape as I had been for my past few races. I taped up my knee, took some Tylenol, and wore my most padded shoes, in hopes that one or more of those things would help me finish the five miles–a distance I hadn’t run since the half marathon over a month ago. Lori arrived at my house promptly at 6 am. We had originally been planning to ride up to Coopertown together, but I needed to go up to Clarksville afterwards, so instead we caravanned. It took us about 30-40 minutes to get there. It was a small race, around 100 people, so packet pickup was no problem. I was pleasantly surprised by the shirts provided: a lime green sleeveless tech V-neck in a woman’s cut. Nice for such an inexpensive, small race! We used the restroom for the final time (inside the city hall building…no portapotties for us!) and did a quick warm up. Soon it was time to start. The first mile went by quickly. Probably because I started too fast. With my knee having issues, I was aiming for 11 minute miles. I knew I probably wasn’t going to get a PR and I wasn’t trying to get one. It seemed like no time before I happened upon the first water station (which oddly no one else seemed to be stopping at). I knew I was going too fast, so I tried to make myself slow down on mile two, which had a nice downhill section and more shade than the first mile. 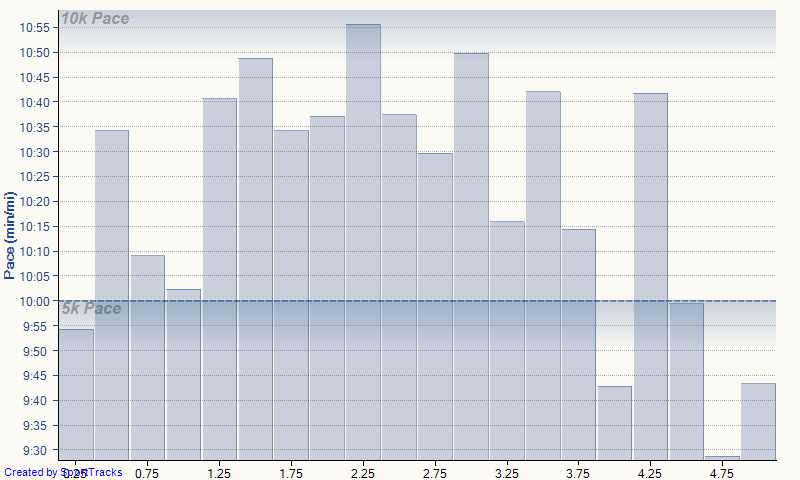 Actually, the second mile was probably the most pleasant (heat-wise) of the entire race. Although it seemed to drag more than the first mile had. Soon after the beginning of the third mile, the girl in front of me dropped her headband. She didn’t notice, so I picked it up and ran to catch up with her. (Luckily, she decided to take a walk break.) She thanked me for finding it, and I continued on my way. And then we hit the sun. After a relatively cool (in the 70s) morning with cloud cover, the sun decided right as the race began to come out and warm everything up. This became apparent right before the halfway mark of the race. I took my first non-water station walk break on this mile. When I finally got to the water station at the end of the mile, I dumped most of it on my body. It. Was. Hot. After running the first half of the fourth mile without any extra breaks, I took them liberally on the second half, which was entirely uphill. I officially hit the longest distance that I had run since the half. 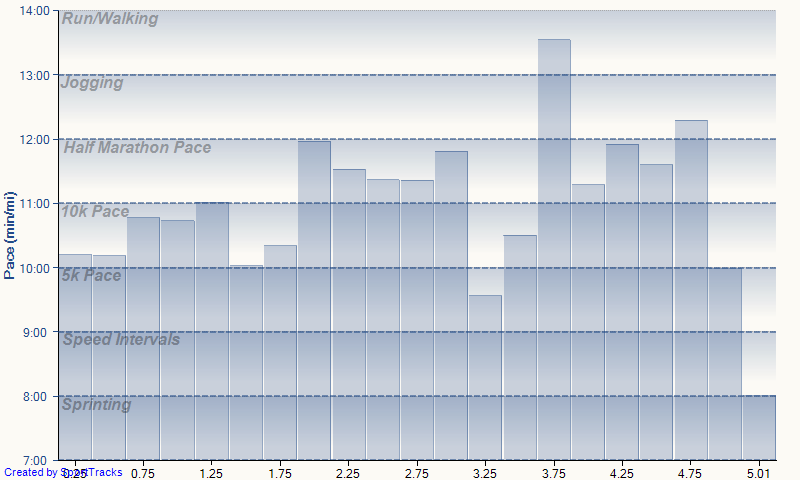 My knee had been dully aching throughout the whole run, but it still wasn’t killing me, thank goodness. I dumped more water on my head at the water station, which meant I was pretty much soaking wet at this point, but it still wasn’t keeping me cool enough. This mile continued the upward climb started on the last mile. My goal for the last mile was to not let anyone else pass me. I walked quite a bit, as the majority of the mile was in full-force sun, but I did run some, just to ensure I had a good lead on the people behind me. With a quarter-mile to go, I picked up the pace and ran into the finish! Overall, it was pretty rough. I did good on the first two miles, but fell apart after that, mostly due to the heat but somewhat due to my knee and the lost fitness from taking time off because of my knee. I was really just glad I finished without being in complete pain. I took the tape off my knee as we were waiting for the awards ceremony and the pain immediately surged the area. I have no idea if the tape was actually helping that much or if my painkillers just wore off at the same time, but wow…world of difference. 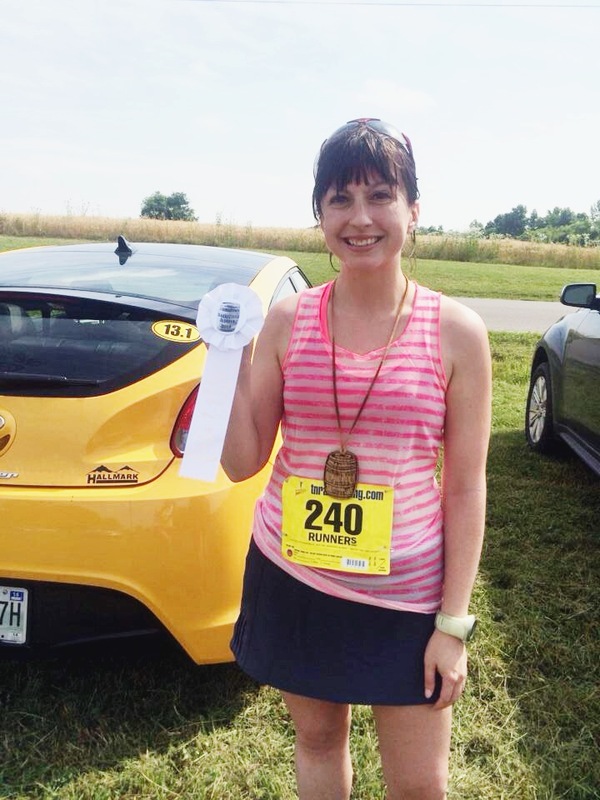 So, speaking of the awards ceremony…I got third place in my age group! I knew it was possible that I could place because I had looked up some of my competition ahead of time (the sign up website listed all the registrants). It was kind of a it-would-be-cool-but-I-don’t-expect-it type goal, but I somehow pulled it through! In fact, the two girls that placed ahead of me had registered that day (so I hadn’t been able to stalk their race times, lol). The girl who came in fourth was only a minute behind me, so it was good that I didn’t let anyone pass me on that last mile. Yay for small races with non-speedy runners! That’s probably the only time that will ever happen, but it’s definitely something cool to put in my race scrapbook. Not too shabby for being four minutes slower than my PR. Placed in my age group! Overall, it was a pretty nice little race, especially for its first year. The shirts were nice and the wooden medals were locally-made. An earlier start would help out with the heat, I think. I’ve also determined that I think I like races with lots of crowd support, which you don’t necessarily get in those through the country. But it was pretty! First thing is that I did good on my tangents because my watch clocked in at exactly 5 miles. (Well, really, 5.01, but I didn’t stop the watch till I was past the finish line.) A small field helped with this, since there weren’t a ton of people to get in the way. Overall, even though I was four minutes slower, I can’t complain too much. I did the race on a bum knee, after all, and hadn’t been running a lot beforehand. 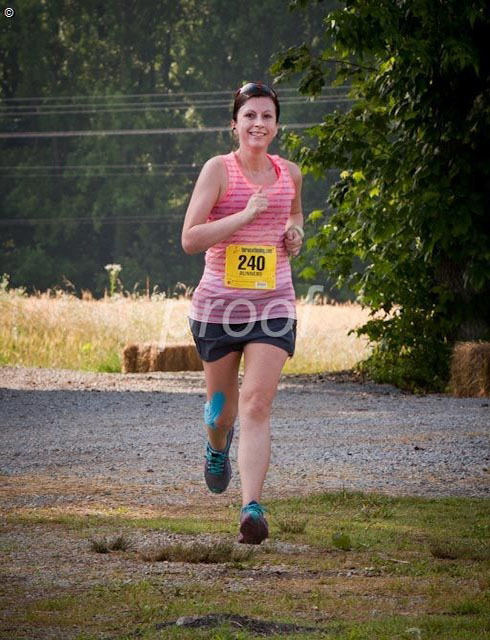 Happily, even though I was limping around for the rest of the day after the race, my knee was fine the next day. I hope that means it’s getting better! 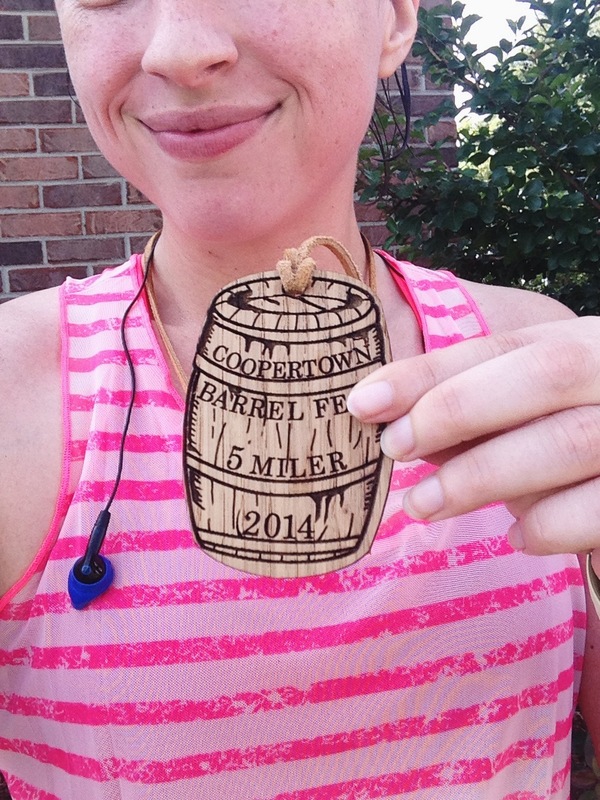 This entry was posted in Race and tagged 5 mile, barrel fest 5 miler. Bookmark the permalink. 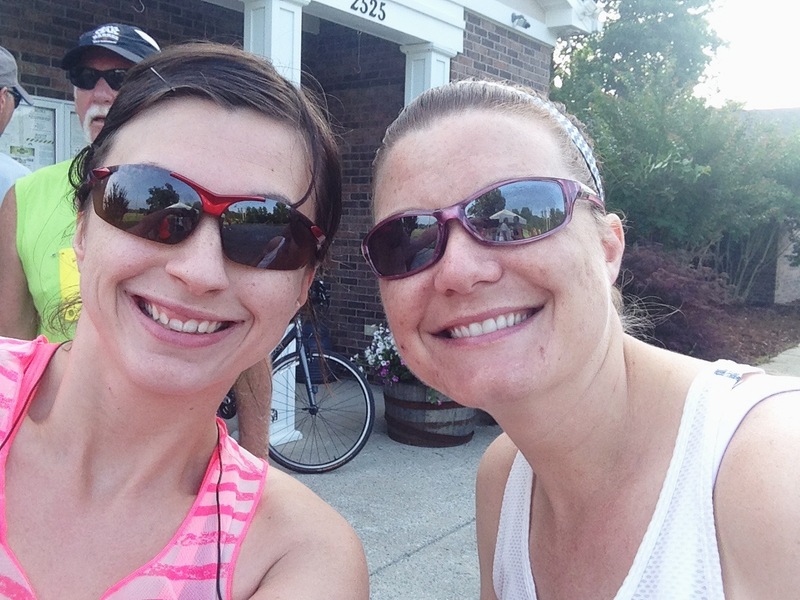 Pingback: Progressive Runner | 2014: Year Two in Review!